PORTOROZ, Slovenia, September 18, 2014 (ENS) – The International Whaling Commission voted Thursday against Japan’s plans to resume “scientific” whaling in the Antarctic next year, but Japan said it would go ahead regardless. The IWC resolution, passed by a 35-20 vote, said Japan should abide by an International Court of Justice ruling that said that its whaling program is illegal because it is not for research purposes. The court ruling in March, in a case brought by Australia, said some “scientific” whaling is allowed under strict conditions, by which Japan said it would abide. The world’s great whales were hunted to near extinction by the early 20th century. An International Whaling Commission moratorium on commercial whaling went into effect in 1986, but since then roughly 30,400 whales have been killed by Japan and the other defiant countries, Norway and Iceland. Hunt said the principles of the Court’s finding that Japan’s whale kill was not scientific research, should be integrated into the work of the International Whaling Commission. “Australia is of the view that lethal scientific research is not necessary,” Hunt said. Australia backs a resolution by New Zealand to the 89 member countries of the International Whaling Commission which would restrict member governments’ authority to issue permits for scientific whaling, until they undergo a full review by the IWC. Although the Government of Japan has announced that lethal whaling will not be resumed until 2015/16, the Sea Shepherd Conservation Society, under the leadership of Sea Shepherd Australia, has adopted the “precautionary principle” and is preparing the three Sea Shepherd whale defense vessels to once again confront the Japanese whaling fleet in Antarctica as it has for the past 10 years. During the 2013/14 whaling season, the direct interventions of Sea Shepherd ensured that the whaling fleet fell short of their quota by 74 percent – saving the lives of 784 whales. “Sea Shepherd Australia is committed to the continued defense of the Australian Whale Sanctuary and the upholding of a 2008 Australian Federal Court ruling that bans whaling in the Australian Antarctic Territory, where most of the whaling takes place,” Hansen said. 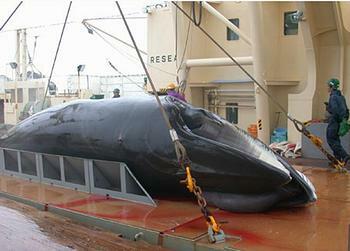 Other conservation groups are pressuring the IWC to make Japan drop its whaling program. 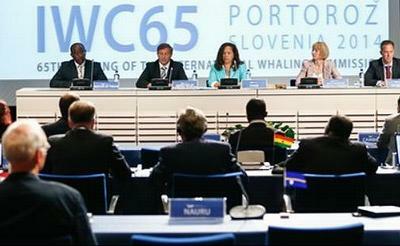 Icelandic whaling was the target of a diplomatic demarche on Monday, the opening day of the IWC meeting. The 28 member states of the European Union have been joined by the United States, Australia, Brazil, Israel, New Zealand, Mexico and Monaco in issuing the condemnation of Iceland’s whale hunts. In a letter delivered to government officials in Reykjavik, the countries expressed their opposition to Iceland’s commercial whaling and to its international trade in whale meat, which they say are out of accord with the country’s treaty obligations. Positive developments for whales during the four-day IWC meeting in the coastal town of Portoroz include passage of a new Action Plan for future work on the welfare of whales. This plan, proposed by the United Kingdom following negotiations with Norway, passed by consensus. Financial contributions committed by governments and nongovernmental organizations will support specific work on entanglement and other deadly threats to the welfare of whales worldwide. On Wednesday, IWC commissioners of the United States, Japan and Russia signed a new agreement for enhanced cooperation to protect the Western gray whale, a critically endangered species that faces threats along its range, including shipping, entanglement, noise pollution from oil and gas exploration and construction activities in its critical feeding areas. 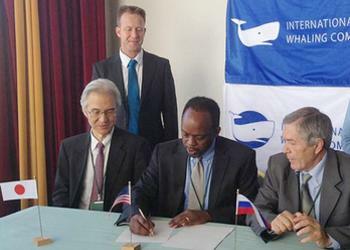 U.S. IWC Commissioner Russell Smith, Japan’s Joji Morishita and Russia’s Valentin Ilyushenko signed the new cooperative agreement to protect Western Gray Whales. In a vote on Monday, the International Whaling Commission decided to increase the quota for Greenland’s aboriginal whaling. Dr. Bernard Unti, a member of Humane Society International’s IWC strategic and communications team, views this move as an increase in commercial whaling.